In Minnesota, we’ve got all those big bagel chains that you’d expect to see: The ubiquitous bagel bakeries and franchises scattered across the states. Those will certaintly do in a pinch, but if you’re looking for the best bagels in the North Star State, you’ll have to dig a little deeper. Here are the 10 best bagel shops in the state. The St. Paul Bagelry, since it opened, has been consistently recognized for baking some of the best bagels in the state, if not in the upper Midwest. Their New York-style bagels are soft and fluffy on the inside, and firm on the outside. This Como neighborhood stalwart has grown popular enough that they are looking to expand to the Tangletown neighborhood in Minneapolis. Now with a Northfield location, Tandem Bagels is a central Minnesota surprise. Just when you thought mass-produced, factory bagels were all you could get west of the Twin Cities, Tandem Bagels pops onto your radar. They use seasonal, organic, and locally-sourced ingredients to bake fresh bagels everyday. Southwest Metro bagel seekers may want to use their drive time heading to Mankato rather than Minneapolis. A stalwart of the Highland neighborhood for decades, Cecil’s is a classic deli. You walk through a small grocery and bakery, the aroma of brine and baked goods following you, to get to the austere coffee shop in the back. The bagel recipe has been in the family and has not changed over four generations of owners. 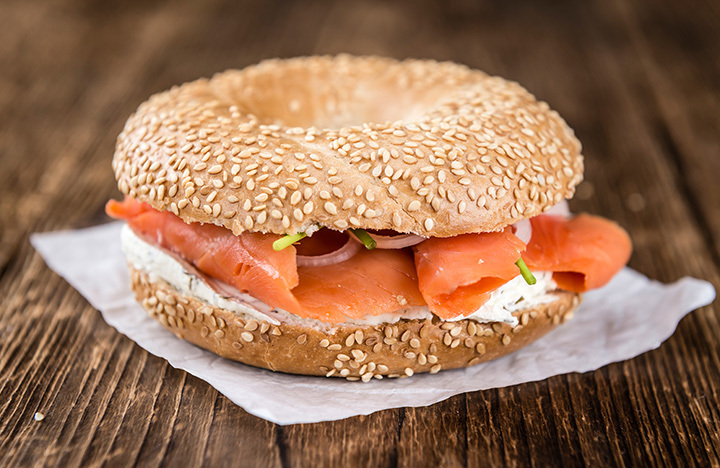 Have some coffee, splurge on the lox, and enjoy Minnesota’s longest-running bagel. Hanisch Bakery and Coffee Shop was recently voted the best bakery in Minnesota on the strength of its cookies and donuts, but its no slouch when it comes to bagels, either. A fresh, changing daily selection keeps folks from Red Wing coming in for a nosh with their morning coffee. Winona Bread & Bagel feeds the town’s folks and students fresh bagels every morning. Each day, they offer nine varieties of bagels, along several flavors of house-blended cream cheese. This may well be the best bagel shop in all of Southeastern Minnesota. Positively 3rd Street is a worker-owned bakery co-op in Duluth’s East Hillside neighborhood, and they happen to kick our some of the best bagels in the Arrowhead Region. With bold flavors like oatmeal date and golden deli, you may just forget to order the schmear. Rise Bagel started as a stand at the Fulton Farmers Market, followed by pop-up stands across the Metro and throughout the year. But now, thanks to producing consistently delicious, high-quality products, Rise is settling into its own North Loop coffee and bagel shop concept. We couldn’t be happier that we now know where to get these delightful rings of deliciousness at all times. Maybe it’s because Prime Deli is located so near the location of the once-beloved, now-defunct Lincoln Del, but it evokes a lot of deli nostalgia—especially when it comes to the bagel and lox on their breakfast menu. What Prime lacks in bagel variety, it makes up for in menu depth. A couple of warnings: The place can get super-crowded on Sunday mornings and as a kosher deli, they are closed from 2:00 pm on Fridays until 9:30 p.m. on Saturdays, when they open for a couple late-night hours. A proper sit-down deli with a bakery case up-front, Crossroads Deli has been serving the best bagels in the west metro since 1996. When the deli first opened, the owners searched for a supplier who could make their breads and bagels the way they wanted them to be. After coming up empty-handed in their search, they took matters into their own hands... and their own kitchen. And we are glad. Common Roots Café is a go-to for organic, locally-sourced, sustainable fare in South Minneapolis. They also happen to bake a seriously delicious bagel. With a fresh variety to choose from every day, you won’t be disappointed when you pop in to this Lyndale Ave. deli for your morning poppyseed bagel.